The electronic programme guide on your TV or set top box is a pretty important piece of software. It is the interface between the customer and their TV. It is used by every customer every hour of every day of their TV experience - and a lot is asked of it by customers. When is the next Champion's League game? What channel can I watch Brian O'Driscoll play his last Ireland game this weekend? What box sets are available for me to watch? I liked the Sopranos - is there anything like that available? I missed Coronation Street last night - how can I get it? The humble software must answer these questions with a speed similar to that of a Google search if the customer is going to avoid frustration. The problem is that the interface we use to ask the EPG these questions is a small piece of plastic with tiny buttons - and rarely a keyboard. Sky is pretty excited about the latest version of their EPG software, the most significant shake-up to Sky’s EPG since its introduction at the launch of digital TV in 1998. 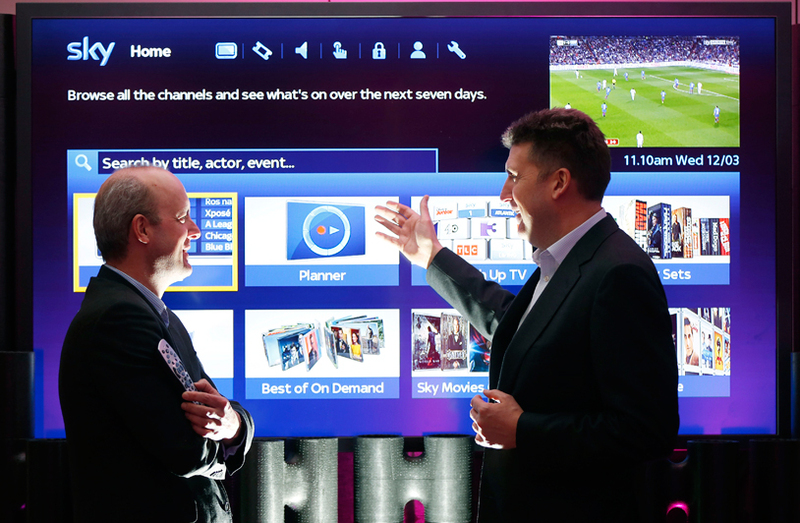 At an event on Wednesday, Sky unveiled the EPG to the press and bonkers.ie were there to hear all about it. Sky takes the Irish TV market extremely seriously and sent in the big guns - Alun Webber (Director of Product Innovation & Services), Mark Anderson (Director of Sales & Marketing) and Mark Deering (Director of Corporate Affairs) were all present. Competition for our viewing has never been fiercer with broadcasters and streaming services such as Netflix and Amazon all wanting their piece of our viewing time. The response from all TV providers is critical. What they want to avoid is prevalent in the US as the "cord cutters" turn to the web to deliver their viewing content. Internet connected TVs through a set top box or built in means the lines between traditionally broadcast TV and downloaded/streamed TV have completely evaporated. Customers don't care how Corrie's Gail Platt gets on their screens. She can come down a cable as electrical pulses or bounce off a satellite as electromagnetic waves - they only care they missed her at 7.30pm and now the kids are in bed they are ready for their fix. The reason for Sky's excitement in launching the new version of their EPG was pretty apparant when Alun Webber began to describe the changes. The simple truth boils down to the fact that people are watching TV differently to even a couple of years ago. We are more demanding, we want to watch TV when we want to and not according to a scheduler. We like to binge on box sets. We like to rent movies without leaving the couch let alone the house. We are extremely selective, extremely demanding and have zero tolerence if technology has a glitch and doesn't immediately obey. The Sky Catch Up service was launched recently and joined the TV Box Sets, Movies on Demand and Sky Store services which were all available from the previous EPG's home screen, which was a simple grid of TV Channels in the TV Guide. In recognition of the change to the viewing habits, Sky has now elevated the additional services to the same status as the TV Guide, and created a clean, crisp and intuitive interface as their new EPG Home Screen. It should look familiar to most people as it is a familiar interface setup - eight tiles across two rows mark the interface to the difference services offered, including TV Guide, TV Planner, Catch Up TV, TV Box Sets. Alun Webber described it as identifying with Customer viewing habits of watching live TV, planned & recorded TV, catch up TV and Box Sets. It makes perfect logical sense to arrange to arrange the tiles in this sequence and should mean that customers are equally at home with the new EPG as they might be with their smart phone - one journalist quipped that the interface update was similar in effect to the jump from iOS6 to iOS7 on Apple iPhones - immediately understandable, immediately usable, strangely familiar. It does look like the Home Screen tiles we're familiar with on iOS or Windows8 - and it functions in a similar way. While demonstrating the features of the new EPG, Alun Webber was able to demonstrate the new Search functionality which now has predictive suggestions - you just start to type the first letter or two of the programme you want to find and the system prompts you with the most likely answers - in the demo, just providing the letter "C" as the search query and the system shot back choices immediately, and the one we were looking for "Champion's League" was right there - pretty impressive stuff. Although the Sky EPG does not support an app ecosystem like some Android set top boxes do, the availablity of Live, Recorded, Catch Up, Box Sets & Movie Rentals is pretty much all I want to do with my TV set top box. I certainly don't want tweets or facebook updates showing up on my TV while my babysitter's there - but that's my preference and everyone has their own. Sky uses the strapline believe in better - well the new interface certainly seems to honour that sentiment. In our testing of the system, we found it to be extremely responsive, intuitive, useful and most importantly, when you find what you want to watch it disappears. Overall our impression is this is a huge improvement. The old EPG has been replaced. 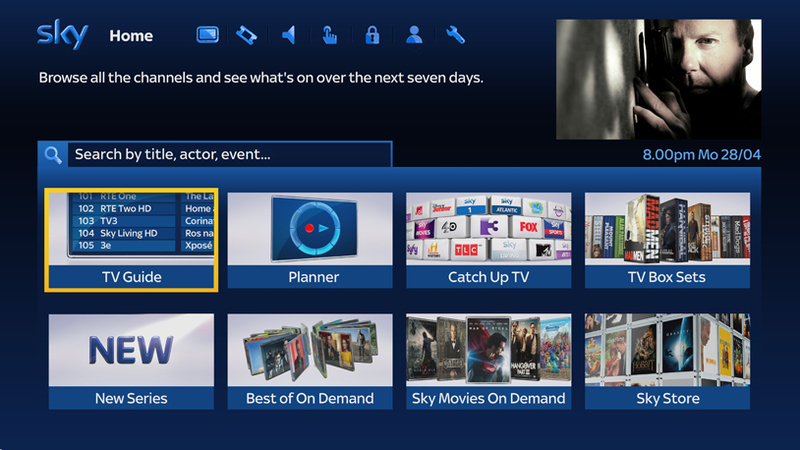 This new version of the Sky+ box software is much, much more than an EPG now, it's the Home Screen to your TV viewing. What do you think about this? Will you consider joining Sky to get access to this new service? With TV packages starting from around €28 per month from all suppliers, this is surely worth a look. Let us know your thoughts in the comments. The new EPG will automatically install on Sky+ HD boxes and will be available to all Sky+ HD customers by the end of this month.